This information has just come to my attention and I would like to pass it along to all interested readers. This should be a very popular event, so register right away. Celtic Colours International Festival attracts a lot of interest locally and globally. Not surprisingly, some of the many beneficiaries are music enthusiasts in Cape Breton. In St. Peter’s a group of amateur players have been hosting open jam sessions and workshops in association with Celtic Colours over the past few years, attracting visiting musicians to sit in with a diverse group of local players, and to take instruction from bona fide Cape Breton players like JP Cormier, Dwayne Cote, Paul Davis, and others. 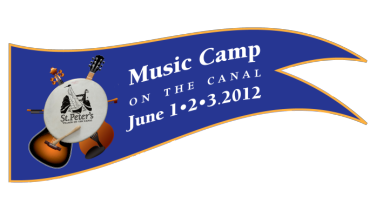 Known as the Kitchen Rackets, this annual week-long attraction has spawned a new weekend event to take place on June 1, 2 and 3 this year – Music Camp on the Canal. The weekend is designed to appeal to traditional music enthusiasts at beginner and intermediate levels, and will provide a day of concurrent workshops on a variety of string instruments, whistle,songwriting, and square dancing. A special feature is the Band Lab, which will be of interest to anyone thinking of forming their own combo. Saturday night will feature a public concert headlining our instructors in the acoustically incredible St. Peter’s United Church Sanctuary. Each night we’ll have open jam sessions. Onsite luthier Johannes Sturm will provide individual consultations, repairs and set up services. Music Director JP Cormier is co-ordinating a talented group of instructors and performers including fiddler Anthony Rissesco, mandolin player Darren McMullen, whistle player Paul Davis, songwriter Hank Middleton – and the local Roddie’s Square Dance Society. Registration for the full weekend, including workshops, jams, concert, most meals is $150 for early-birds (register by May 1 for this special price), after that: $195. Partners who don’t want to take lessons but want to join the rest of the food and fun can register for just $100. Further information: Greg Silver, Camp Director (902) 631-5050 or by email above. Full details and a downloadable registration form are available at http://www.kitchenrackets.org.